I want to point out that my dear husband is the one who did all the smoking. I merely observed. Not only did he build the fire, he make his own lump charcoal out of oak chunks. This involves a few extra hours of work, but my sweetie wants only the best. Since we found out that charcoal contains all kinds of additives including actual coal. Yuk. 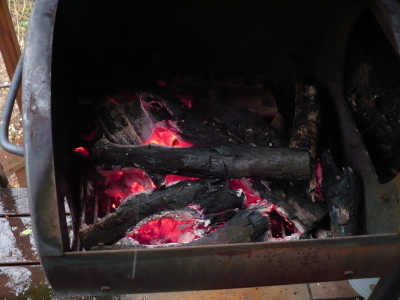 We supplemented the oak coals with hickory chunks to enhance the flavor. DH tended the fire for nearly 4 hours, maintaining it at the optimal temperature. The smell was amazing. Nice grill too - that looks like a real bbq. Thanks for the report Darcie! 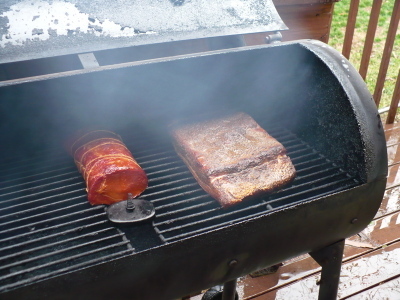 So the next time I can get a pork belly, I will smoke one or two five pound pieces as bacon. 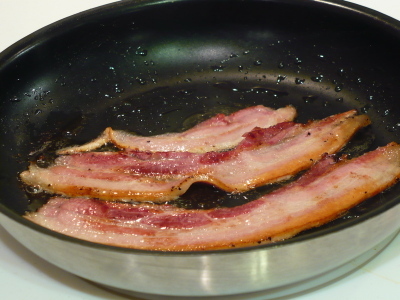 I've roasted the maple bacon and that is very good. Your project looks like a success! 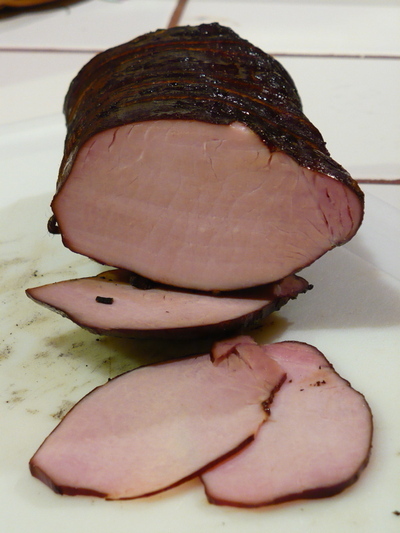 The photo of the canadian bacon is particularly inspiring since I haven't tried that yet. 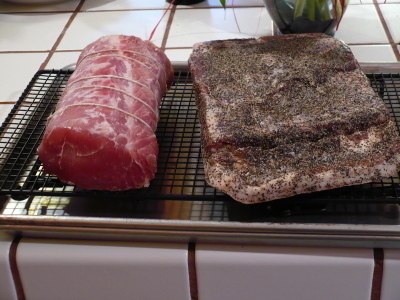 I'm starting a second round of bacon (and this time pancetta too) tomorrow. Wish me bacon luck! 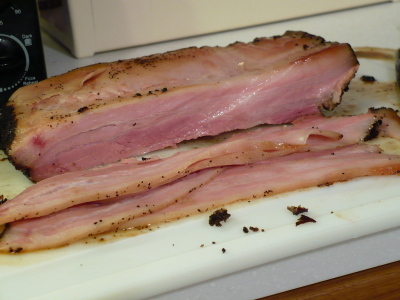 We just roasted some maple bacon this weekend as well. Our piggy's belly was portioned into one-pound pieces so we can make lots of different varieties. That looks really good, but for the next batch, especially of the Canadian, try fruit wood as the smoking chips. I've used Pear and Grapevines in the past year. You will like the result - I guarantee!!! I would like to try fruit woods for smoking. I ran out of time for this batch, but I have access to free apple wood, so I might try that.